I first heard David Hobson give a talk at the Stradford Garden Festival. He was getting more laughs than the average standup comedian. 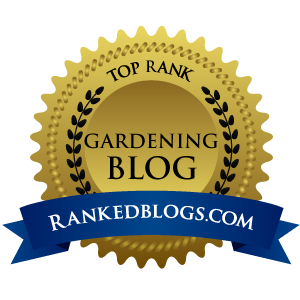 Humour is a great tool for a garden writer – it reminds everyone that home-gardening is not just an arduous task that eats up your free weekends. It can be relaxing and fun. "I've always written humour so it is natural to insert a little of it into my newspaper columns. Certainly, gardening can become too serious. I look for the joy in it," David tells me. David was born in Yorkshire England and came to Canada on a travelling adventure with no intention of making it his home. 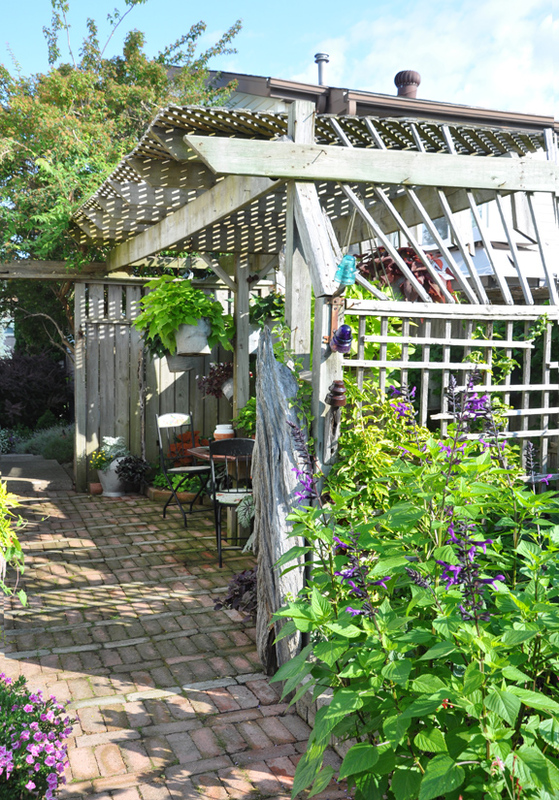 A passion for gardening developed with his father's influence. "My dad had always gardened and I began as soon as I had a piece of ground to grow plants (at our first home–the current garden is our third)", David reminisces. David jokes that there are "ink stains on his green thumb." 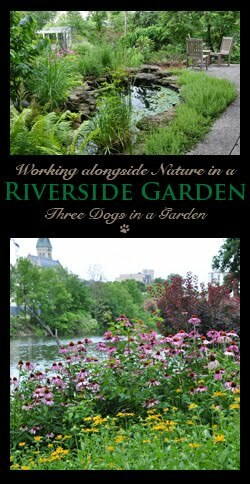 Always interested in writing, he joined a writer's group and wrote two books of humorous garden stories Soiled Reputations and Diary of a Mad Gardener (available on Amazon as ebooks). 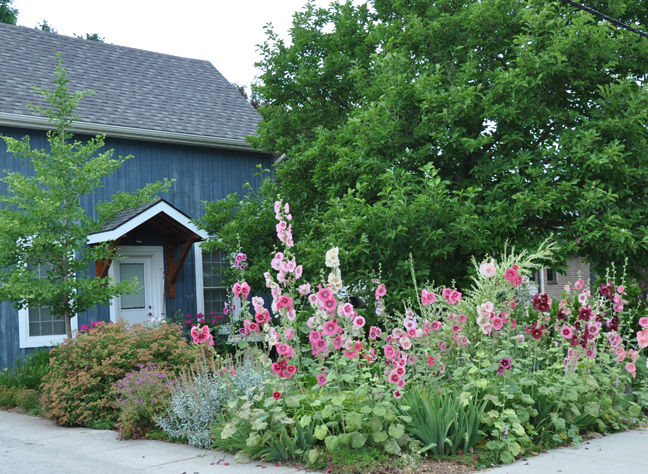 In 2001, the Waterloo Region Record asked him to contribute a weekly gardening column. Since that time, David has taken on the same task for the Hamilton Spectator newspaper as well. 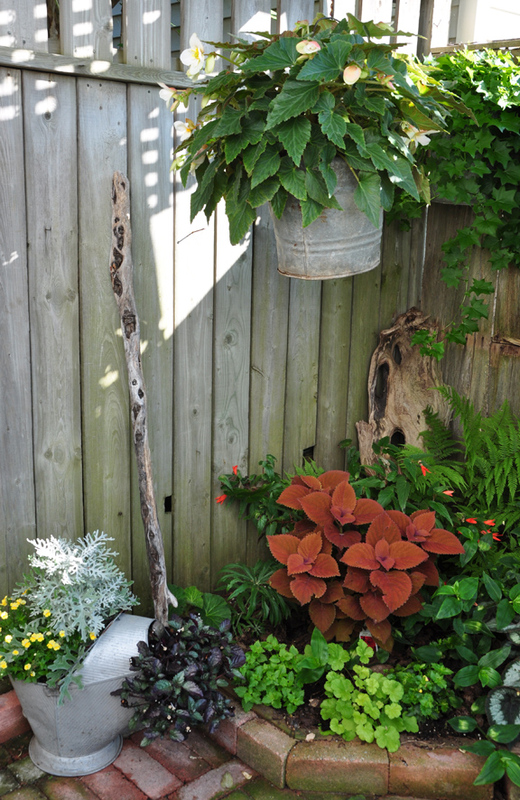 Examples of wit and humour can be found throughout David's garden often in the form of repurposed objects. Take the "bright idea" you see above. "It's what I call my spring flowering bulb," laughs David. "I broke the end of a bulb cleanly once and immediately realized I was holding a tiny terrarium (or planter). Then my son figured out how to easily remove the ends of the bulb," David recounts. 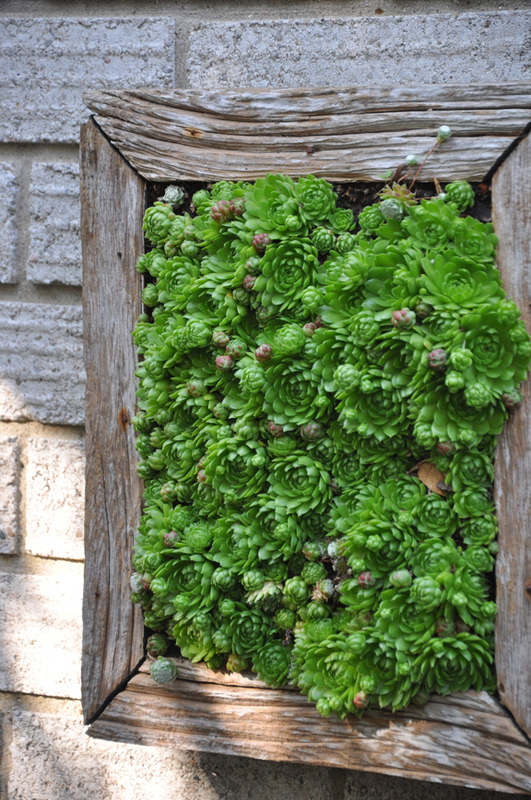 David's backyard is a creative laboratory where he makes things like the framed succulent wall art you see pictured above and the covered area in the photograph below. 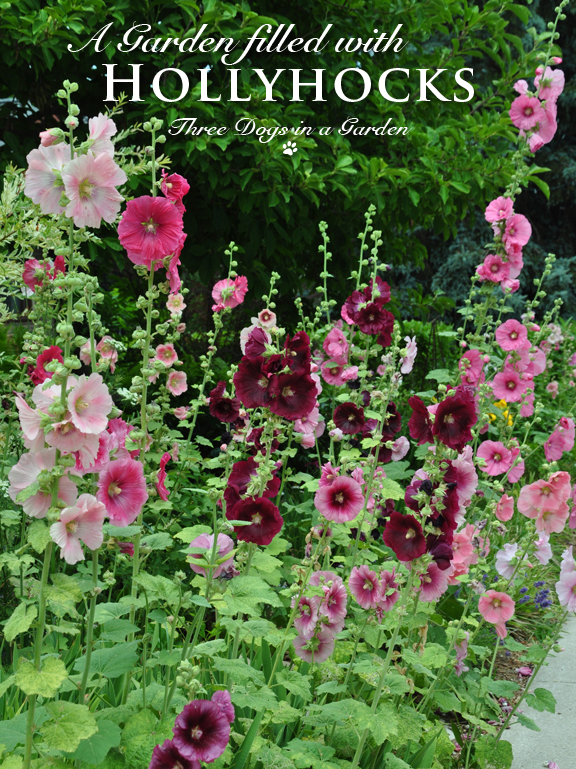 "I have as much pleasure in that as I do in growing plants. 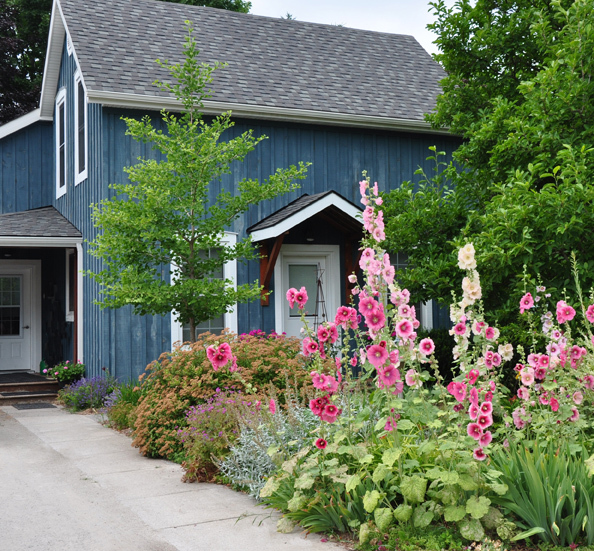 It comes from the constructing of things that I enjoy–building pathways and patios, fences, decks and garden furniture," says David. Many of these projects are also born out of practicality. 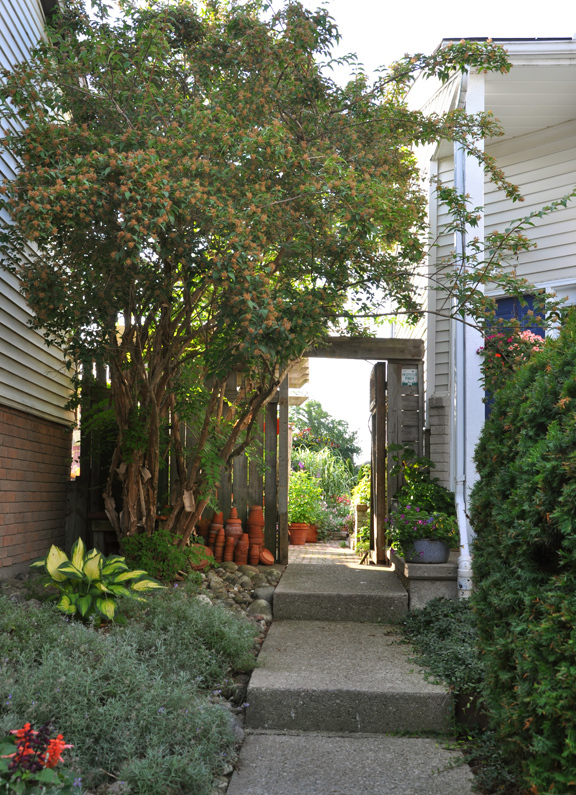 "When we first bought the house in 1985 there was no shade at all, so I created a shady courtyard," David tells me. 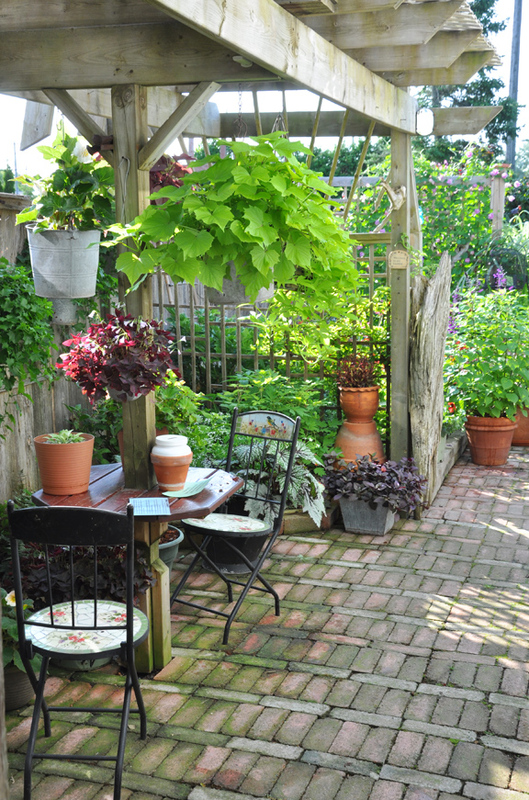 The courtyard is now home to his collection of shade–loving plants. 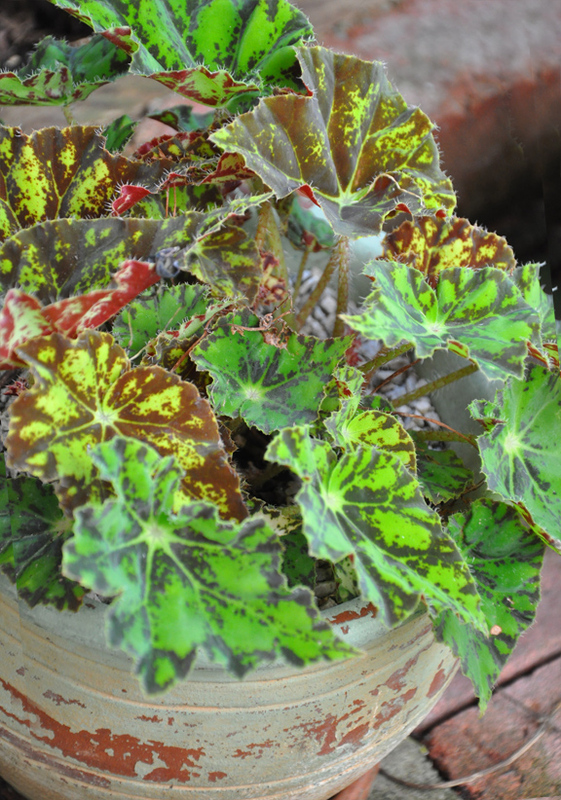 Houseplants, like David's collection of Rex Begonias, vacation here in the summer. Begonias and ivies spill from old sap buckets. More plants trail out of an old coal bucket. 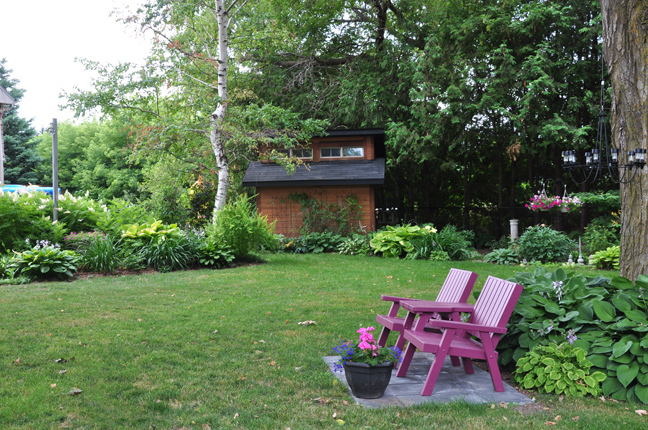 In the centre, there is a table and chair for a break from garden chores on a hot summer's day. 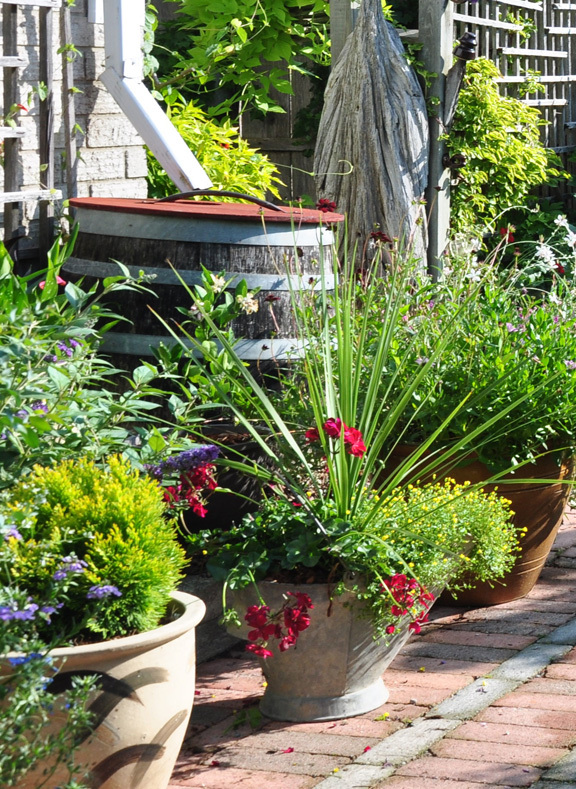 In David's imaginative hands, an old coal bucket becomes a container planting and a sap bucket a hanging basket. "If it holds soil, it will make a planter," laughs David. 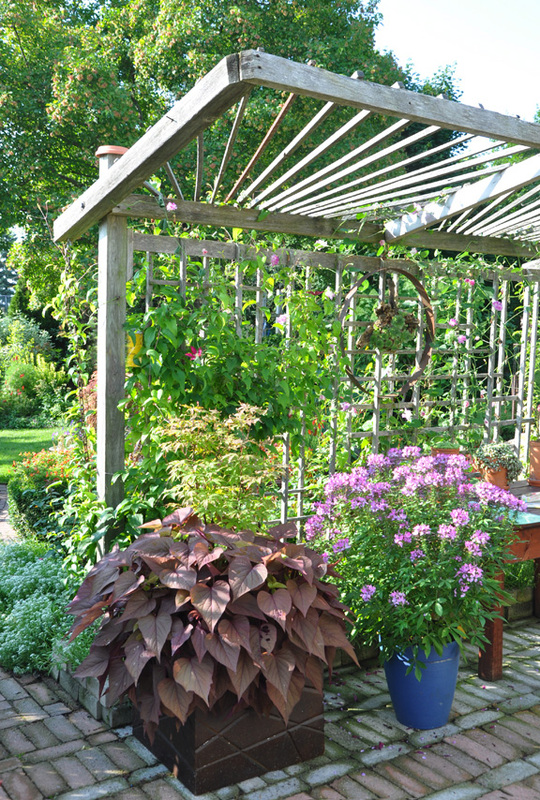 Amongst the shade loving plants is a colorful red Coleus named 'Campfire'. Begonia in a sap bucket. 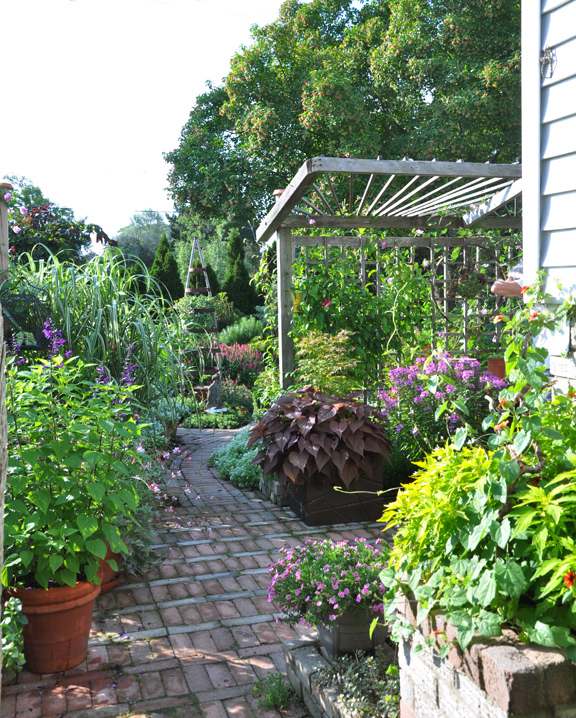 "One thing I like to do with my containers is to mulch the soil surface," says David. 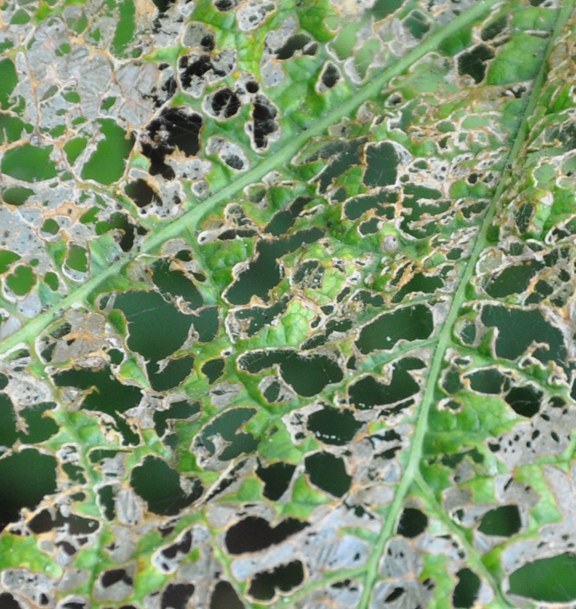 "Until the plants have filled out it is exposed and loses a lot of moisture. 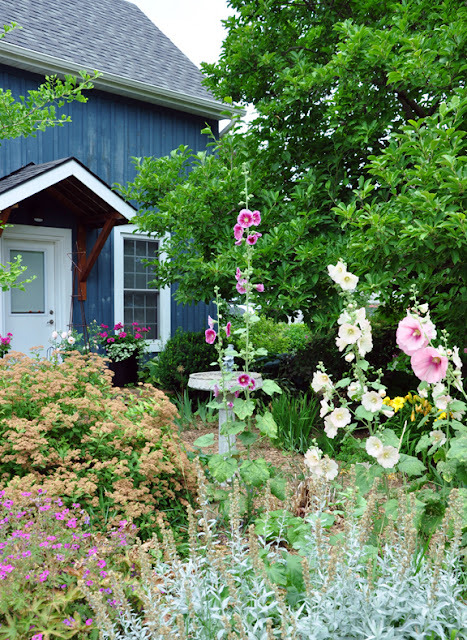 We talk of mulching flowerbeds, but it applies equally to containers." 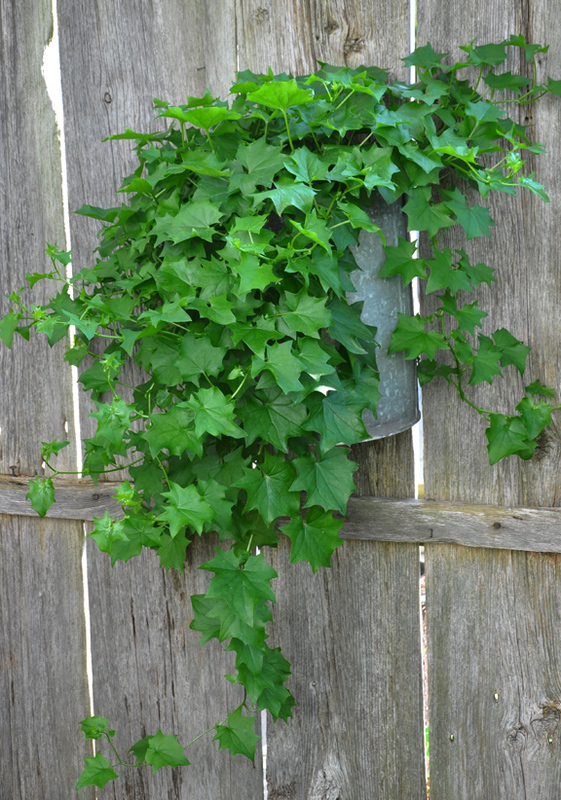 A sap bucket mounted on the fence holds an ivy. One of David's Rex Begonias. 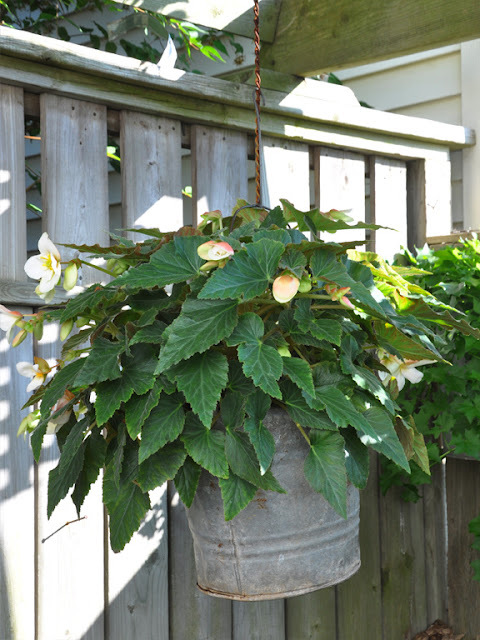 "One plant that is becoming more popular is the Rex begonia with its showy foliage. 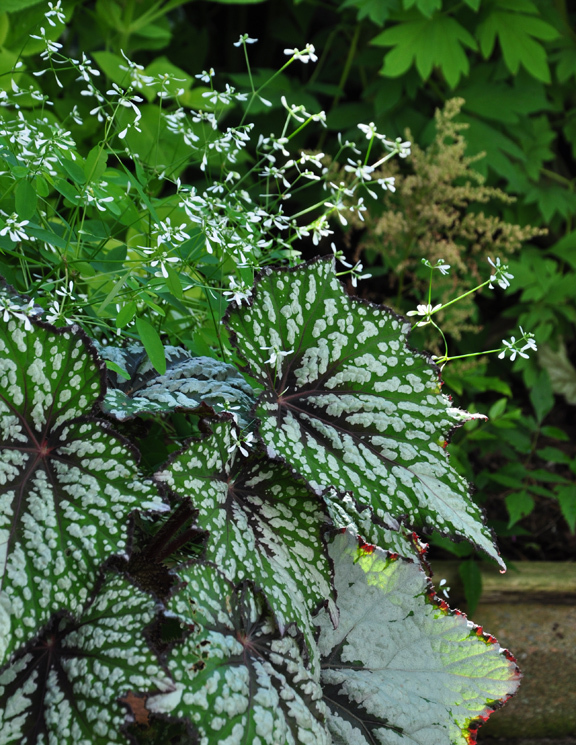 They are related to the tuberous begonia, but they are not known for their flowers. They come in every shape and size and in every color combination and pattern. 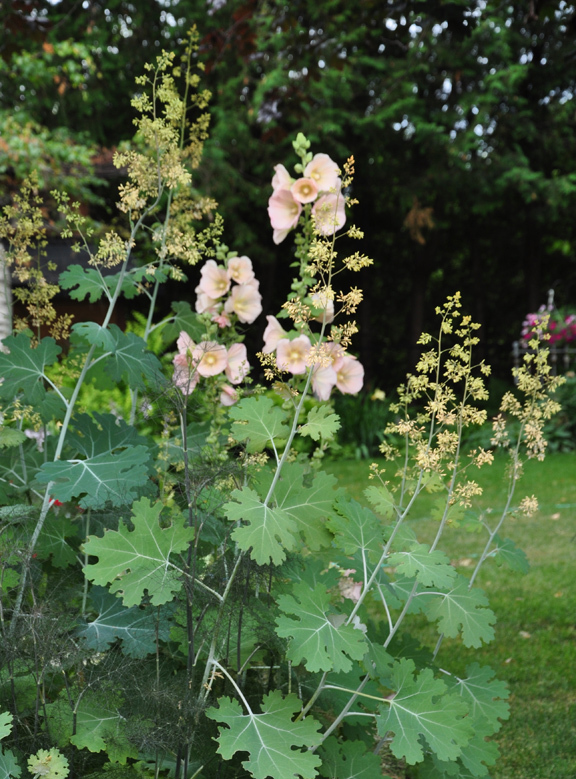 This is a plant that is best when grown close to the ground. They prefer humidity otherwise the leaves tend to curl", says David. 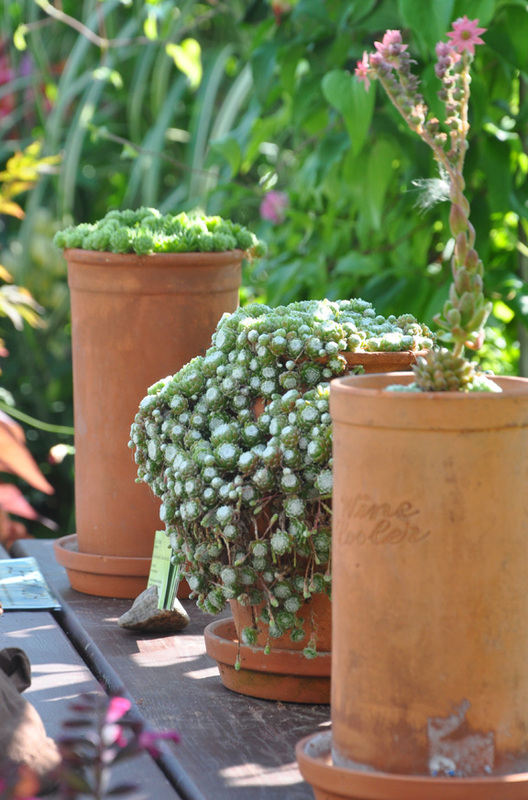 A pretty combination of a Begonia rex-cultorum 'Jurassic Green Streak' and an annual Euphorbia. 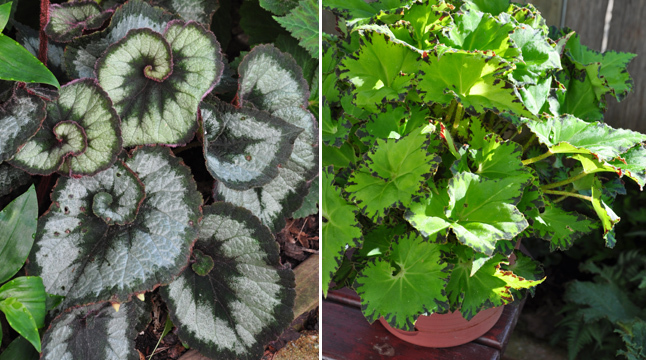 Rex Begonia 'Escargot' (left) and another unknown Rex (possibly Begonia 'River Nile') with brown accents on the leaf edges (right). 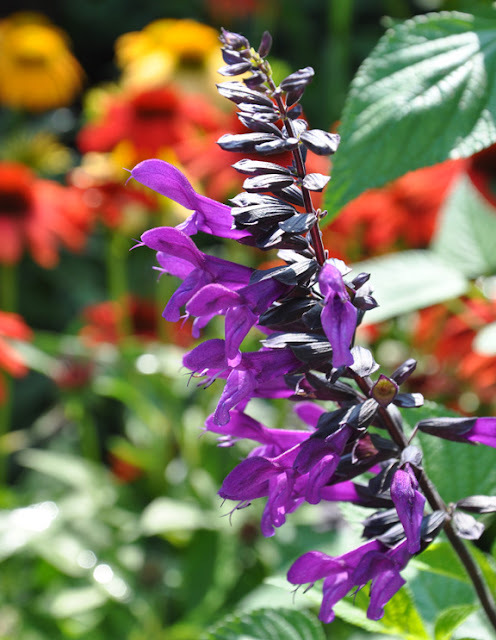 Purple Salvia Patens 'Amistad' is a tender perennial that has purple flowers on tall near-black stems. 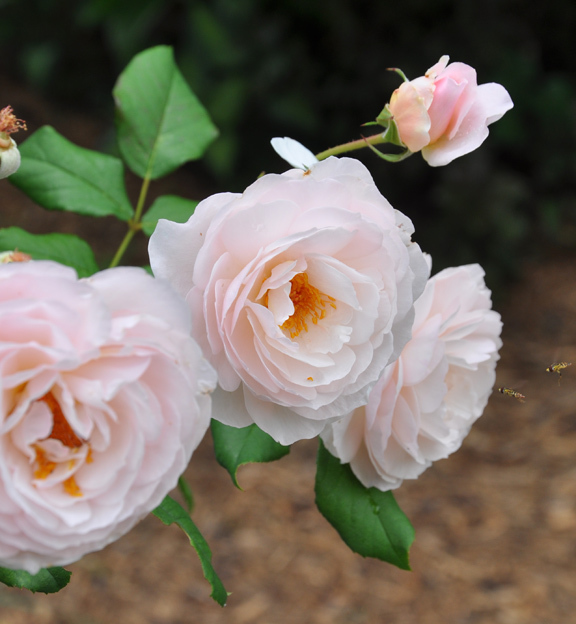 Light regular pruning will encourage repeat flowering. Full sun. Full sun. Height: 90-120 cm (35-47 inches), spread: 75-90 cm (29-35 inches). USDA hardy zones: 8-9. 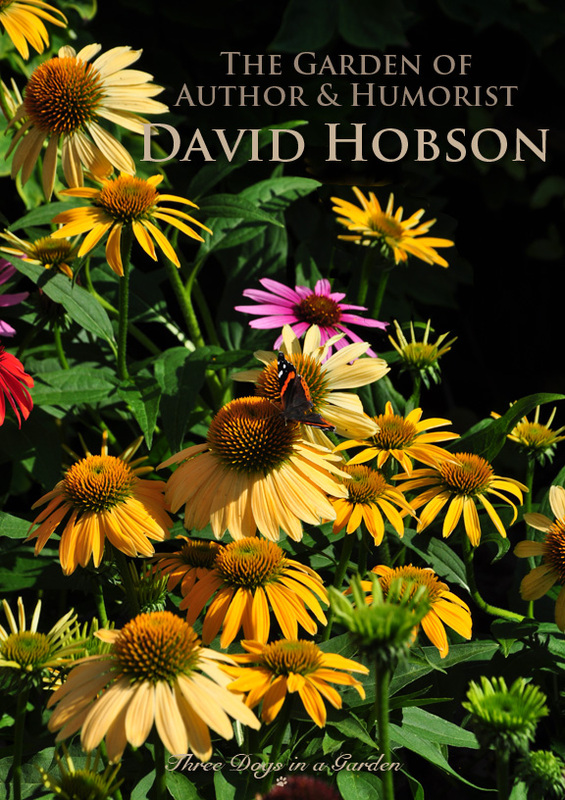 When David loves a plant, you'll often find more than one in his garden. "I love my Salvias," he says. "There are over six hundred species, but I don't have them all. 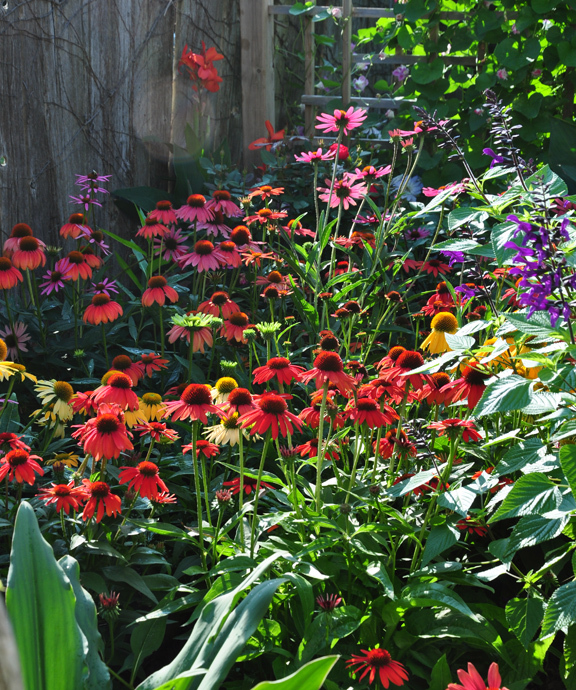 They come in annuals, perennials and shrubs. 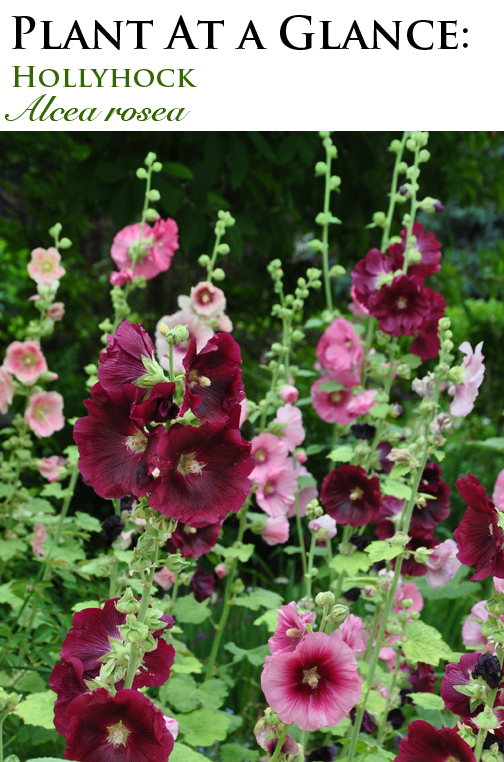 I have two that are perennial–but not in this climate. I store them in my non-freezing garage over the winter. 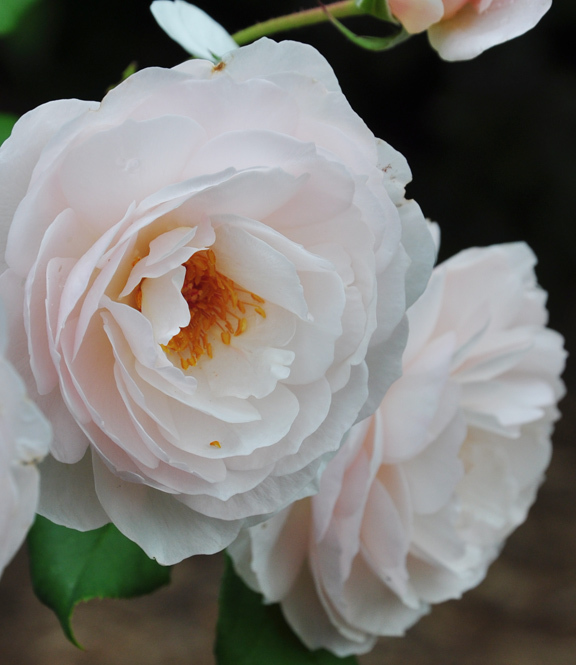 This one is Amistad (above). 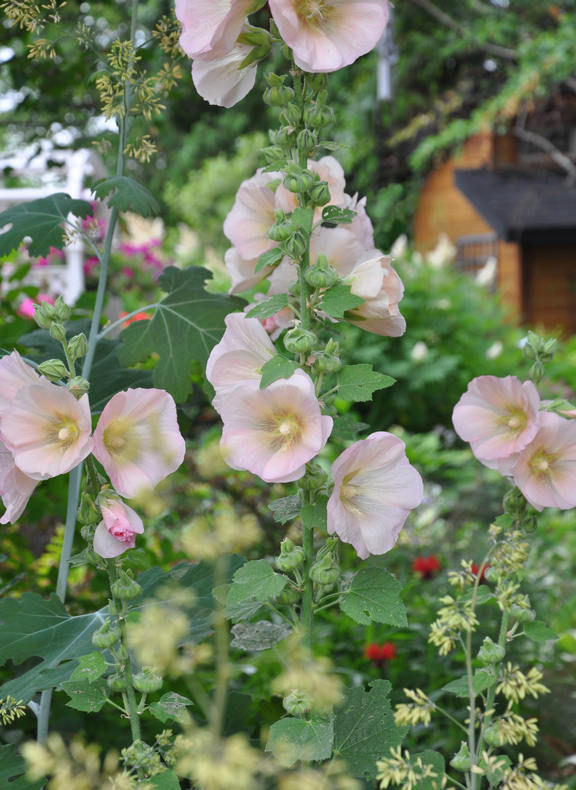 It flowers all summer long. 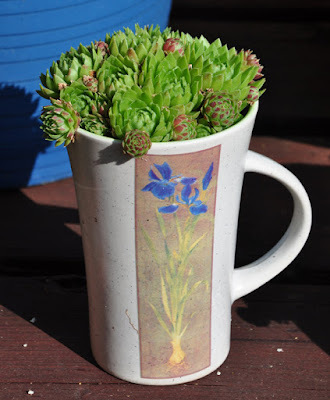 Snip the dead flowers off and it will flower even more." 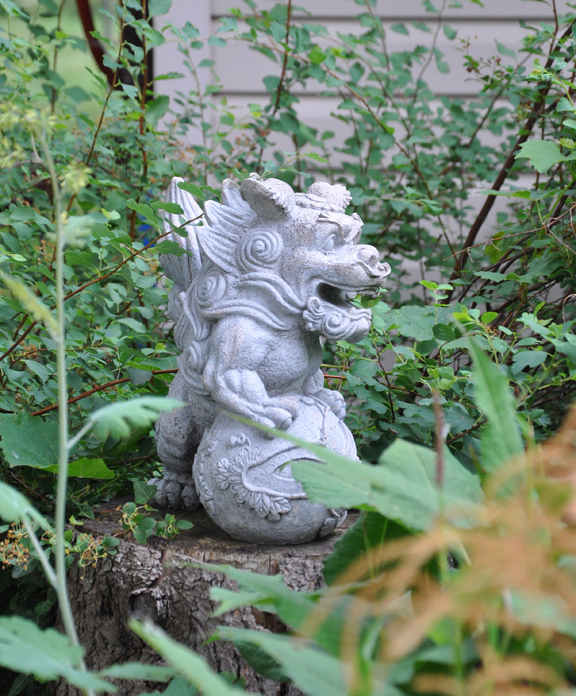 A hint of what is yet to come on our tour of David's garden. 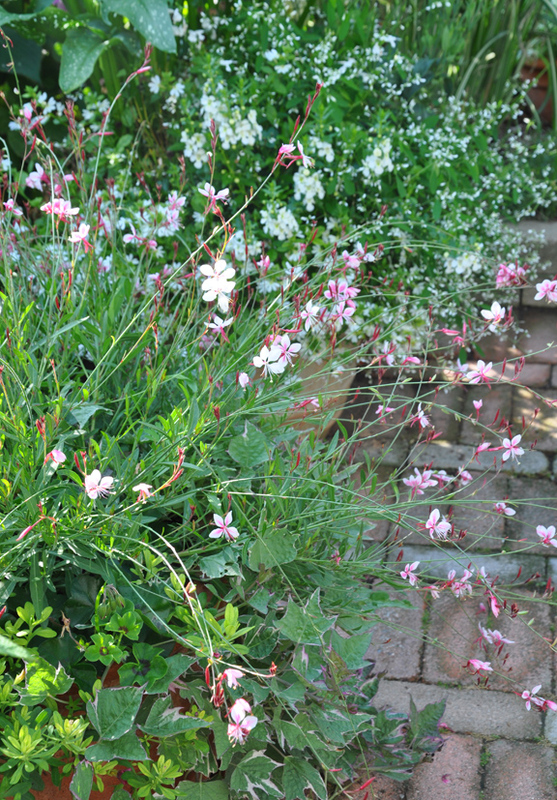 David keeps other tender perennials, like this Gaura (above), in pots and overwinters them in the unheated garage as well. 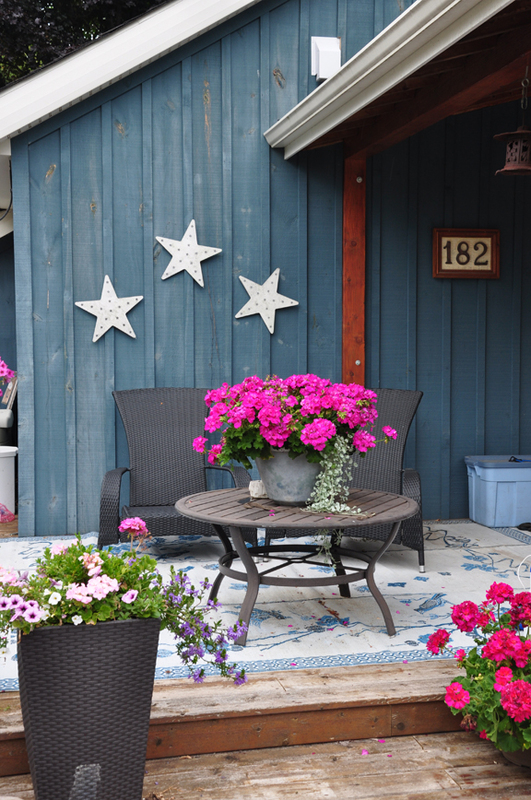 Fushia and Lantana also winters in the garage. 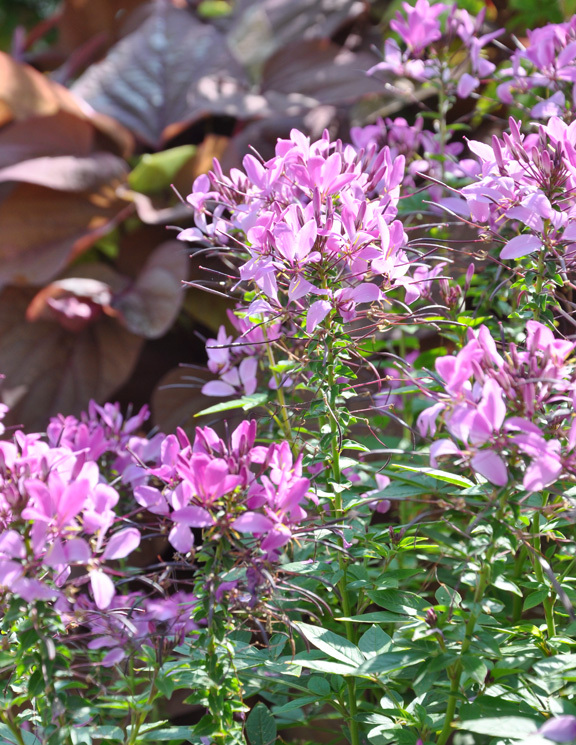 Spider Flower, Senorita Rosalita Cleome® is a new introduction from Proven Winners that offers many advantages: it's thornless, non-sticky, with odourless foliage and is heat and drought tolerant. 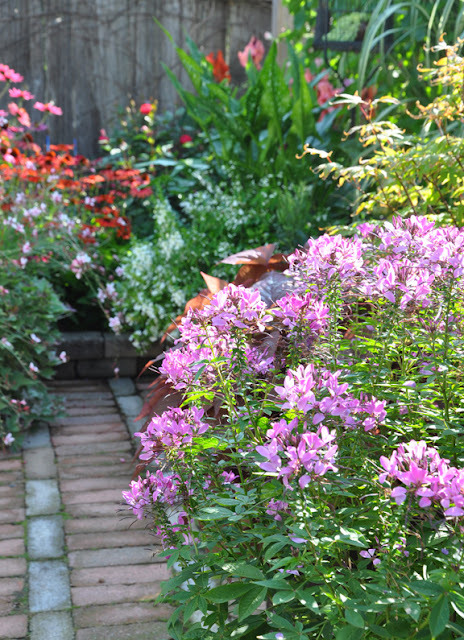 Unlike other Cleome, it will not self-seed. Full sun. Height: 30-45 cm (12-18 inches), spread: 65-75 cm (45-60 inches). USDA hardy zones: 10-11. 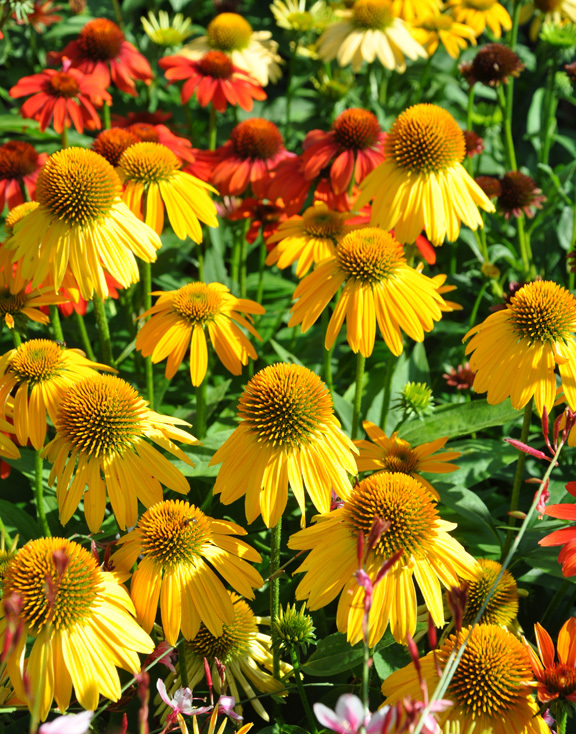 Echinacea 'Cheyenne Spirit' is a hybrid Coneflower that produces single flowers is yellow, cream, orange-red and magenta. 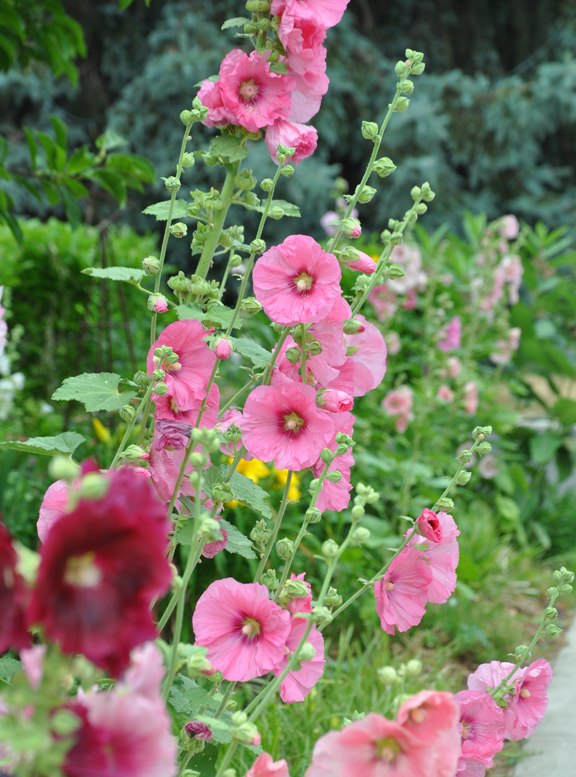 'Cheyenne Spirit' is happy in average garden soil but is adaptable to sandy and clay soils. 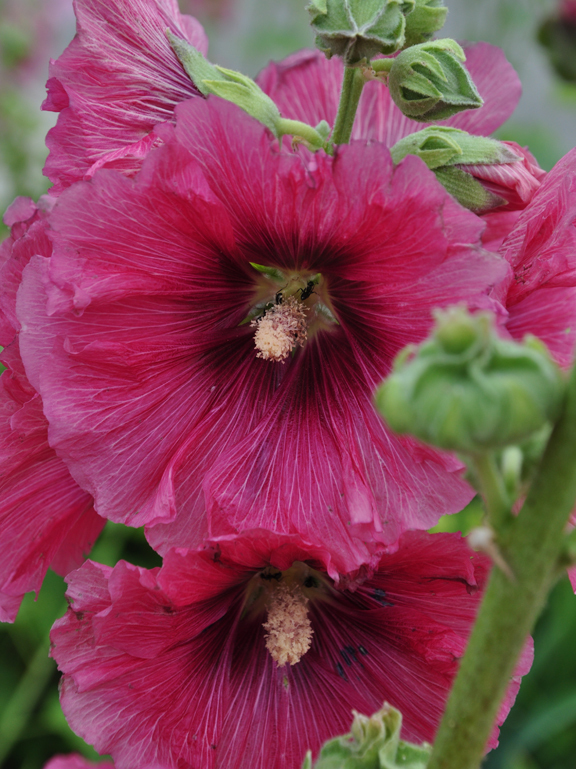 Average, dry or moist conditions all work for this perennial. Attractive to butterflies. Full sun. Height: 65-75 cm (25-29 inches), spread: 65-75 cm (25-29 inches). USDA zones: 4-9. 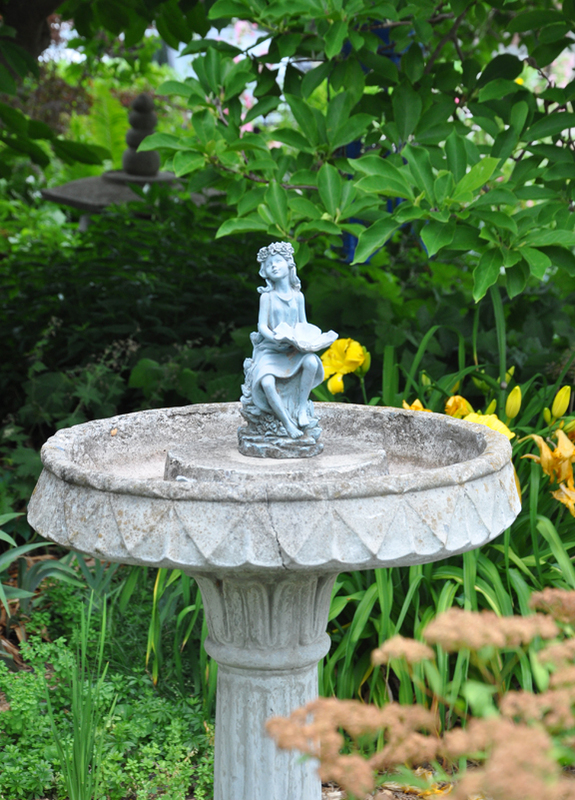 Drought is becoming a common struggle in the summertime. 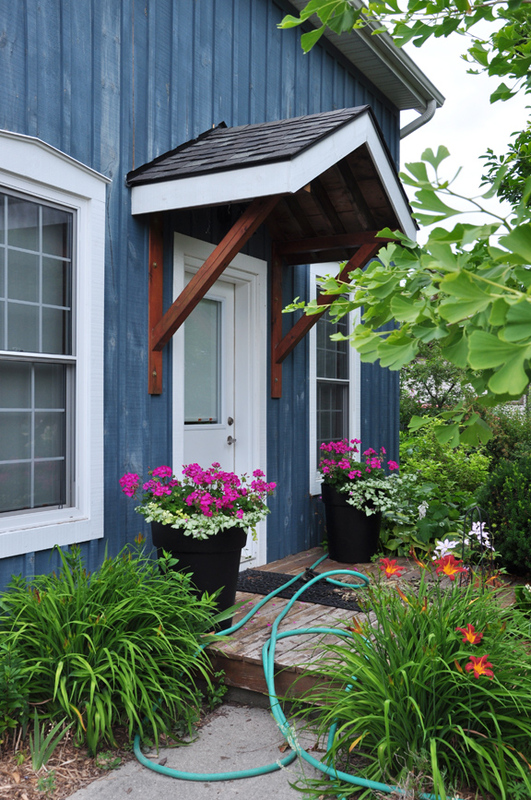 David collects rainwater in a large barrel that is handy to many of his container plantings. 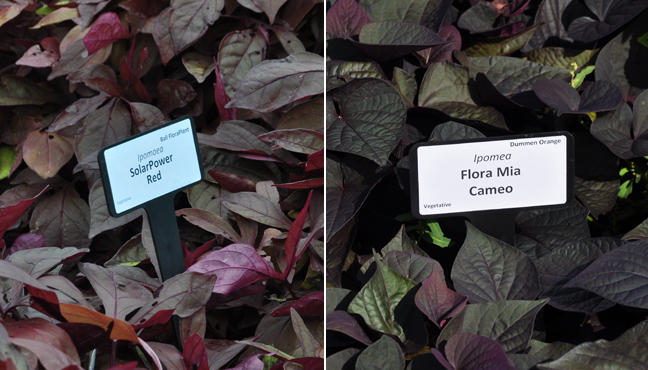 Chartreuse colored Sweet Potato Vine are really popular, but there are new tempting introductions with red and almost black foliage. Sweet Potato Vine is a versatile annual that can be grown in sun or shade. 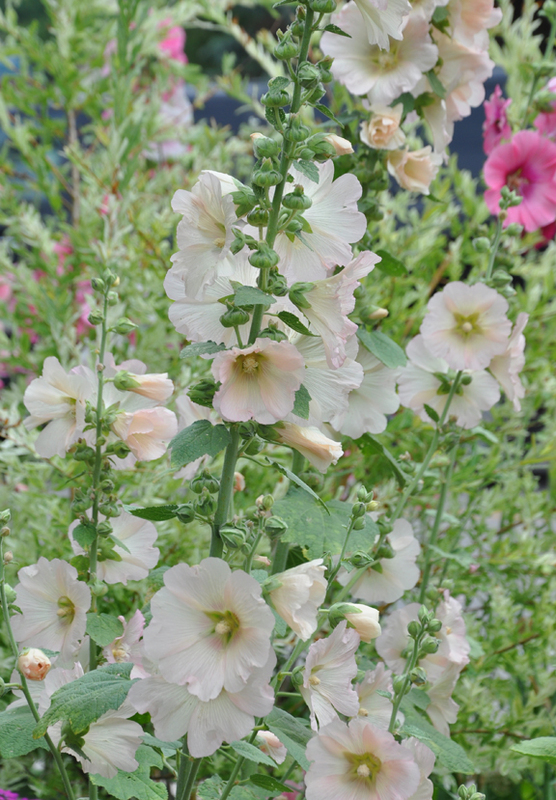 It likes moist, well-drained soil. 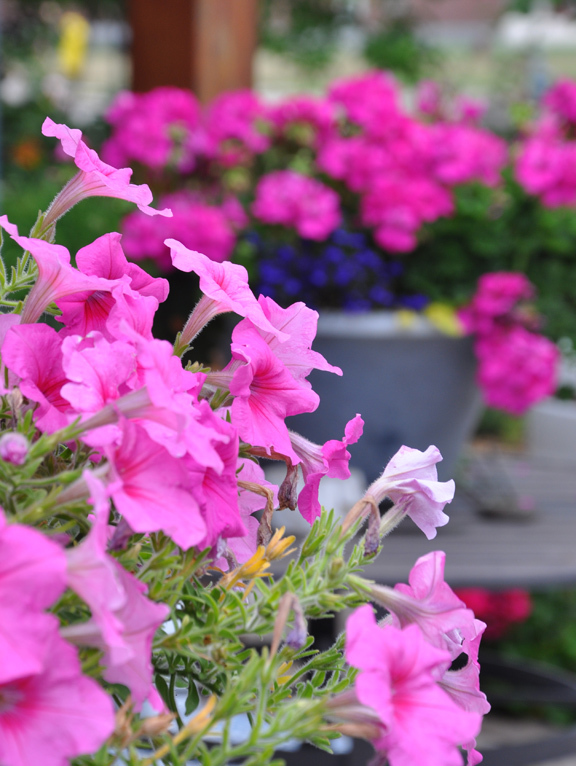 Superbells® Doublette Love Swept is an annual introduction from Proven Winners® that has double petunia-like flowers that are pink with a white rim. 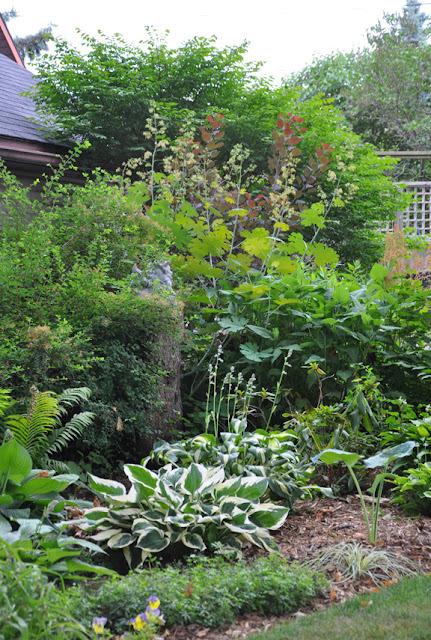 A light pruning early in the season and mid-summer will encourage branching and new growth. 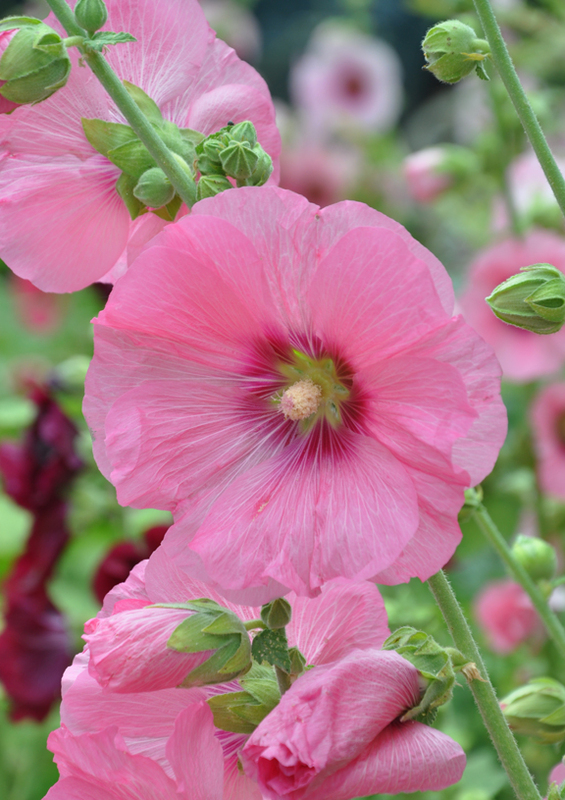 No deadheading needed. This plant does not like constantly damp soil. 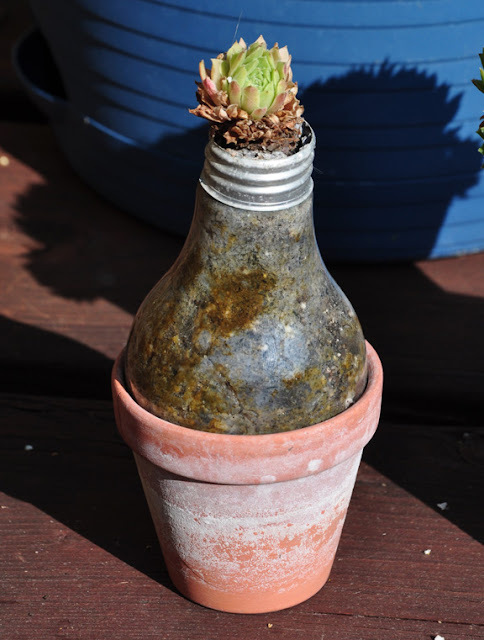 Containers are the best use for this plant. Full sun to light shade. Height: 15-25 cm (6-10 inches), spread: 30-60 cm (12-24 inches). 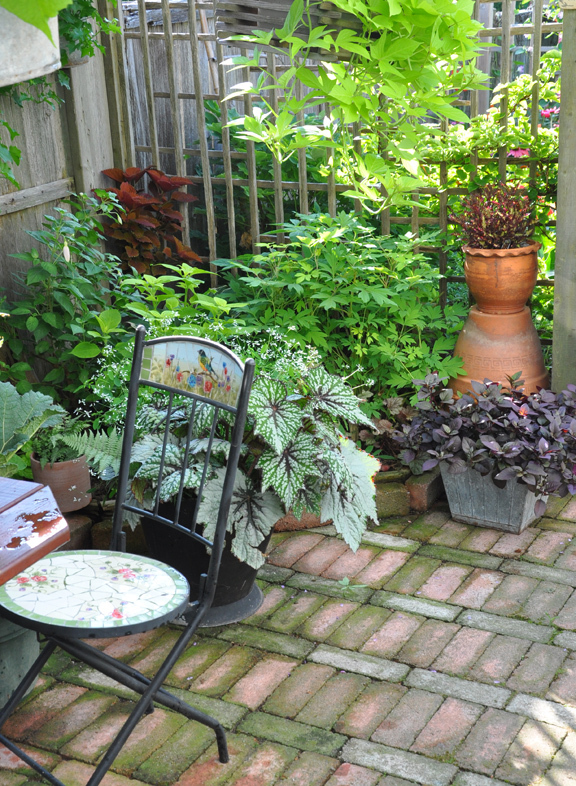 A potting bench and a collection of sun-loving plants. Did you notice the mop bucket that has been painted and repurposed as a container? 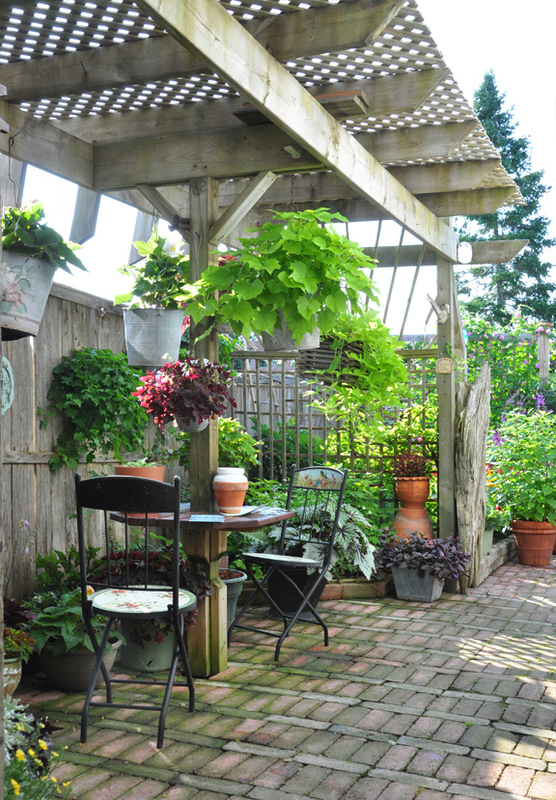 "I have far too many pots and planters. 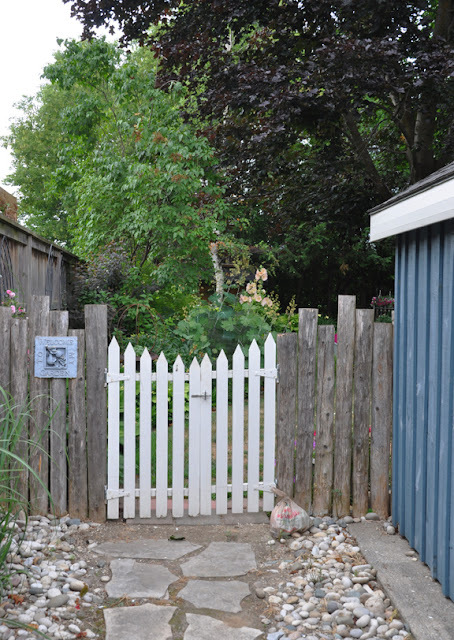 I have a shed full of wooden boxes, terra cotta pots and galvanized pails. 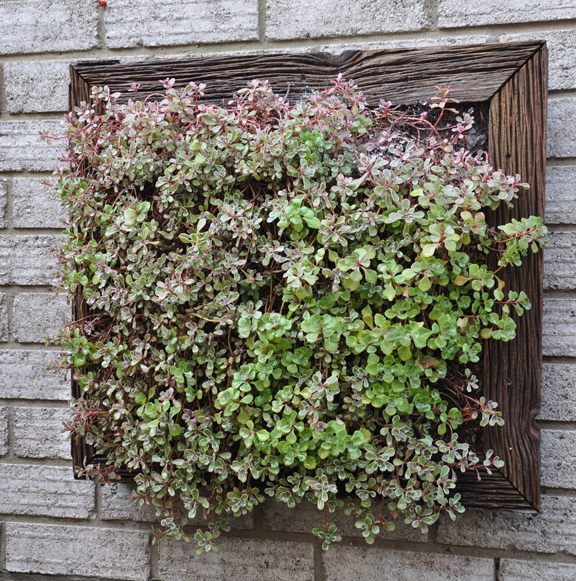 In fact, I will turn anything that holds soil into a planter–but I do draw the line at plumbing fixtures. 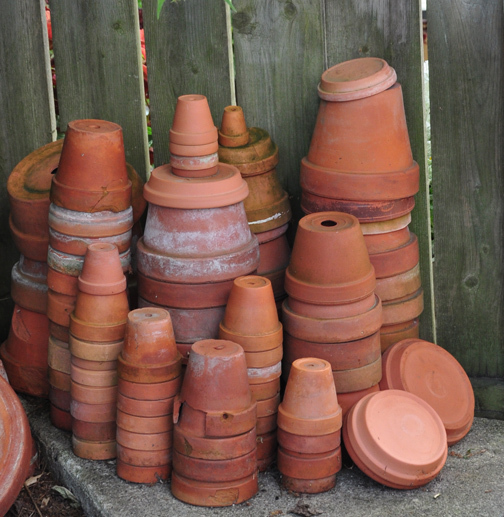 I have old work boots–I've tried open umbrellas; pots, pans, hats, purses, baskets and bowls...even eves troughs. The danger lies in overdoing it. 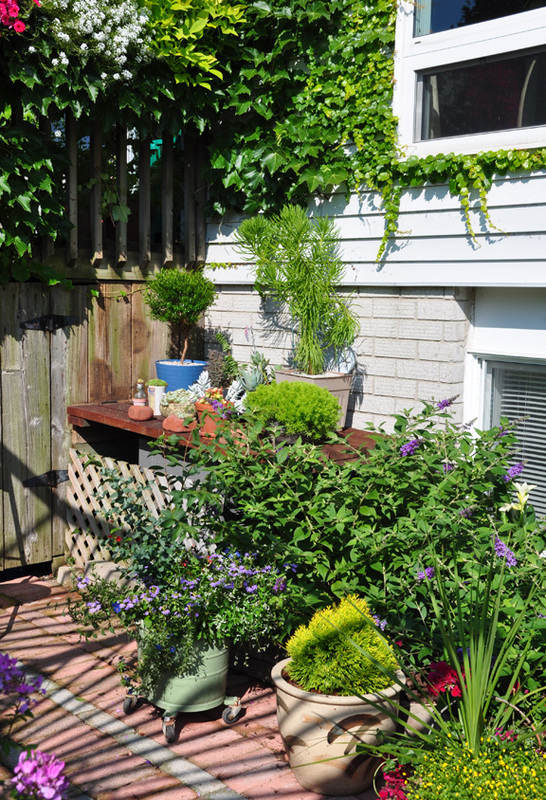 Too many "unique" items can make the backyard look like the back room of a junk shop–especially if the plants aren't thriving," cautions David. 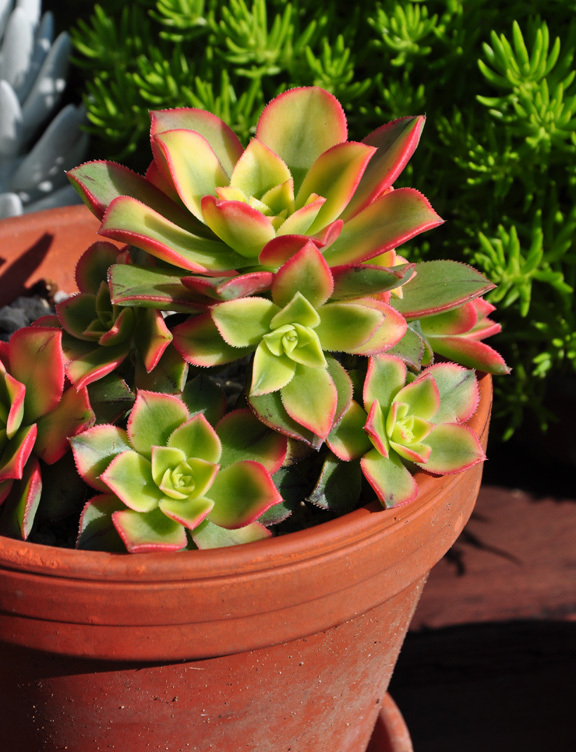 Aeonium haworthii 'Dream Color' also known as Aeonium 'Kiwi' has fleshy green foliage edged with orange-red. 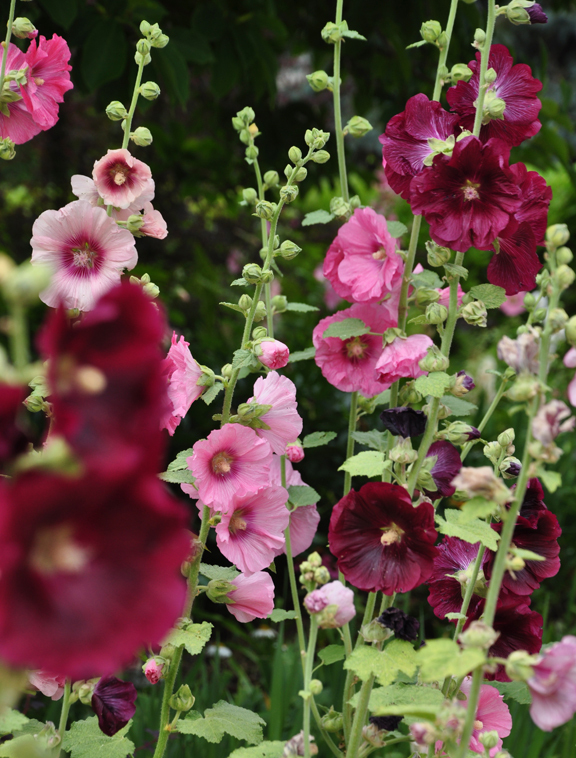 It does not like heat and very dry conditions (their true growth season is winter into spring. They can go dormant in the heat of summer). To keep them happy in mid-summer, place them in a location with part-shade in the afternoon. They like to have soil that is a bit moister than most succulents. 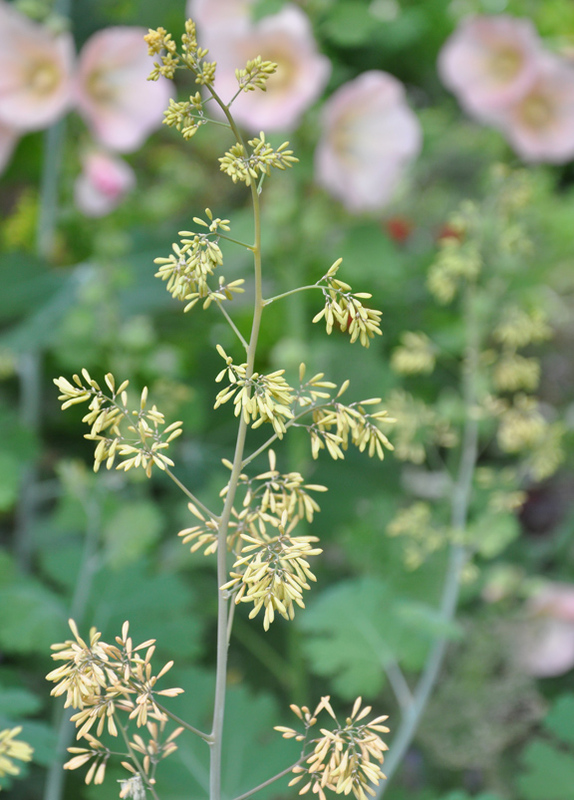 In late summer they will often produce yellow flowers. There is a lot of humor in David's use of containers. Here we have low-growing plants in tall pots. 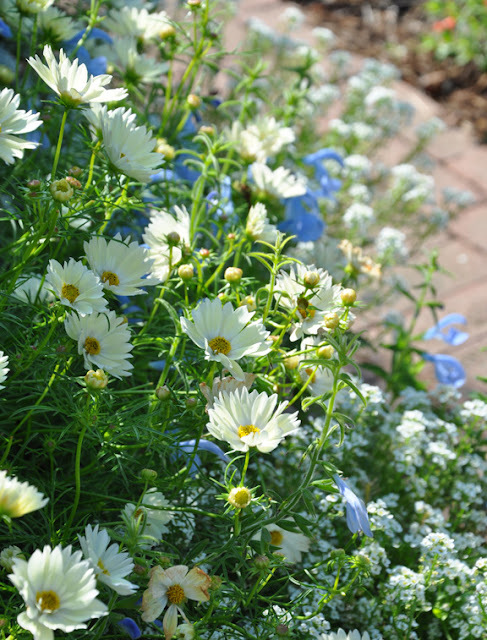 Cosmos 'Xanthos' is a compact annual with flowers that are a soft, creamy-yellow in color. Good cut flower. Full sun. Height: 50-60 cm (20-24 inches), Spread: 25-30 cm (10-12 inches). Salvia patens 'Cambridge Blue' is a tender perennial (in zones 8-9) or annual that has sky-blue flowers. Tubers can be lifted and stored like dahlias. Attractive to hummingbirds. Rich, well-drained soil. Average water needs. Full sun. Height: 60-75 cm (24-30 inches), Spread: 45 cm (18 inches). 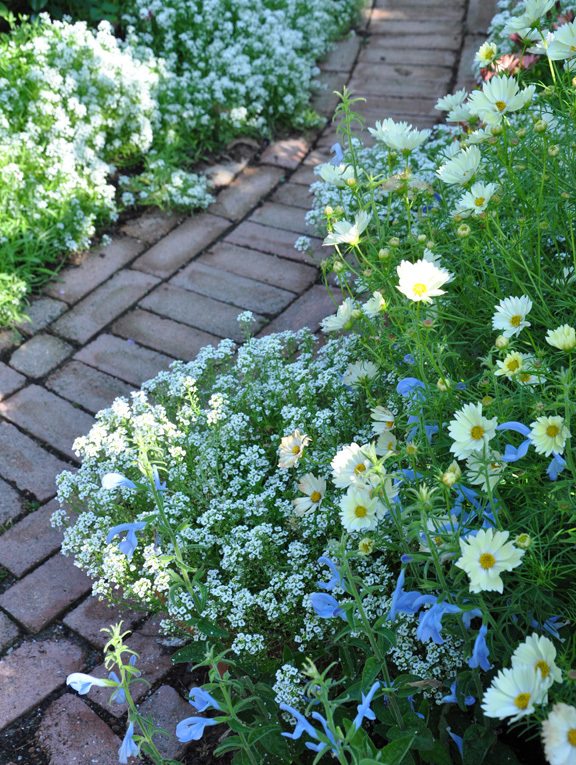 Alyssum 'Snow Princess' is an annual from Proven Winners® that has fragrant white flowers. 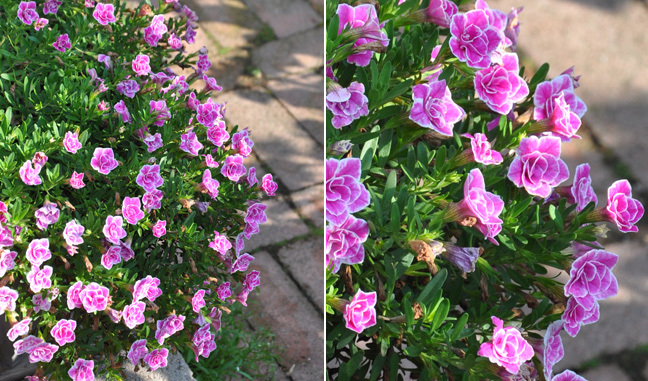 This is a vigorous plant that can handle both heat and cold. Evenly moist soil is necessary for good performance. Part-sun to full sun. Height: 10-20 cm (4-8 inches), Spread: 60-122 cm (24-48 inches). A Youtube video about David's garden. 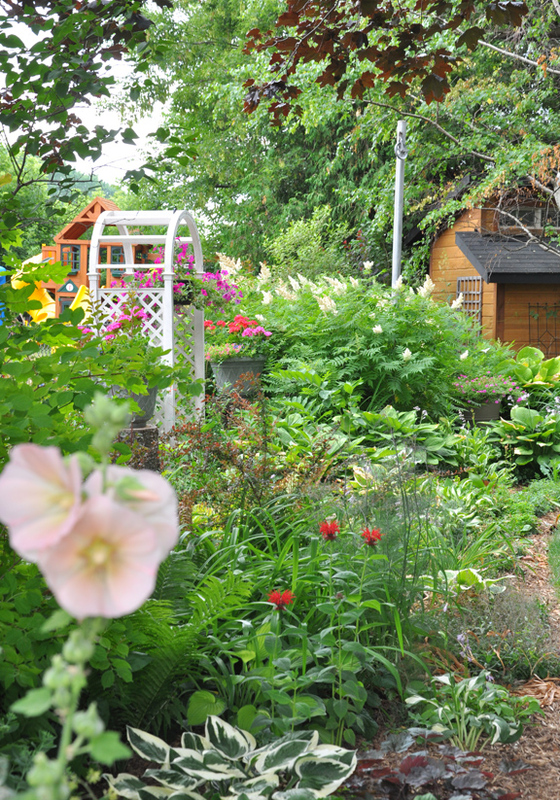 I am going to end with a short video on David and his garden. Enjoy! P.S. More of the garden to come soon in Part 2.